I always been interested in the many aspects of performance, recovery being a major one. When I began running in college, I religiously took some kind of carbohydrate and protein in a 3:1 or 4:1 ratio (based on what I was seeing in the research world at the time) after ever single run. That quickly evolved to having chocolate milk after ever run because that is what I had heard was "Nature's Natural Recovery Drink." Putting aside the fact that natural is a horribly misused word and that the chocolate must be added to cow's milk (which some people may also argue is not natural for us to drink), I love chocolate milk and it has been a staple of my diet and recovery for many years now. I dabbled a bit in the more commonly known recovery drinks like Endurox R4 (which never mixed well) and First Endurance Ultragen (left a weird taste in my mouth) but didn't really feel a difference from using chocolate milk. Fast forward a few years to the late winter of 2013 when I saw at Foot Traffic (the local Portland running store I work at part time when I am home) we were caring a new product from Fluid. 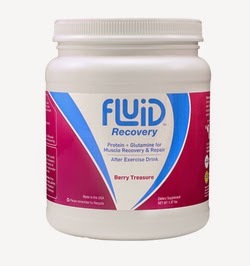 Our customers had good things to say, so I finally bought some Fluid Recovery to test out. I honestly went in with the mind that it wouldn't do anything, but was very quickly proven wrong. 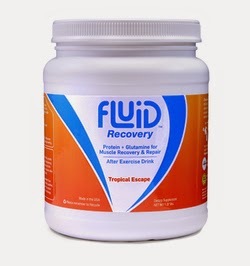 Nutrition: Fluid is a lactose and gluten free recovery drink that has a ~3.5:1 carbohydrate to protein ratio (research seems to support either a 3:1 or 4:1 ratio for endurance exercise). A single serving has 128 calories, 0 grams fat, 25 grams of carbohydrate and 7 grams of protein. Vitamin C (166%), Calcium (4%), 250mg of Sodium, 125mg of Potassium and 2500mg of L-Glutamine (an amino acid) are also listed in the nutrition facts. For carbohydrate, Fluid Recovery uses a combinatino of Maltodextrin and crystalline fruit sugar. For protein, whey protein isolate is used. L-glutamine is a nonessential amino acid (our bodies make it) that can be found in sources of meat, dairy, eggs, wheat, beans, beets and various vegetables. Although the body makes it, L-glutamine level drop after long exhaustive exercise and supplementation after such episodes may have an increased immunologic effect (Castell, Newsholme & Poortmans, 1996). Consistency/Mixing: Here was another surprise based on my based experiences with Endurox R4 and other recovery drinks. Fluid Recovery actually mixes pretty well. I haven't had any issues with clumping unless the water I use is REALLY cold. I can fully rely on the fact that when I come back from a hard run, my recovery drink will be ready in seconds if I haven't already mixed it. Obviously if you don't shake or stir your bottle or glass well enough there will be some particles left at the bottom. Just make sure you mix it well enough for 5-10 seconds and your drink will be ready to be guzzled. Price: Like all specialized recovery drinks, Fluid Recovery is a bit expensive. Price wise it comes out to $2-3 per serving. To me this is well worth the price. I have felt and experience a clear difference in my running the days following the use of fluid. I have hammered workouts and been able to not only think clearly after during class, but have also felt better, less stiff and been able to run faster the following days. And yes, when I ran out I did not purchase more Fluid Recovery for a few months. During that time I felt the clear difference that Fluid Recovery had made. It was enough that I made another order and will continue to do so because this product has worked very well for me. Conclusion: As I mentioned, taking Fluid recovery after runs has resulted in noticeable results the next day. I've felt better, been able to run faster and recover better using Fluid when compared to chocolate milk. I even alternated hard workout days with fluid and chocolate milk just to see what would happen. Every time Fluid helped me recovery better by the next day. The Chocolate flavor tastes great and I have had next to no clumping issues or problems with consistency. I highly suggest at least trying one packet of Fluid Recovery (Fluid Sports Nutrition does sell individual and sample packets). I have thoroughly enjoyed this product and plan to make a new order as I ran out again a while ago and haven't been recovering as well!!! As always, my views are my own. This product was a personal purchase. *Images obtained from the Fluid Sports Nutrition website. Go down to your local running specialty retailer to check it out! Castell, L., Newsholme, E & Poortmans, J. (1996). Does glutamine have a role in reducing infections in athletes? European Journal of Applied Physiology and Occupational Physiology, 73(5): 488-490. Lunn, W., Pariakos, S., Colleto, M., Karfonta, K., Carbone, J., Anderson J & Rodriquez, J. (2012). Chocolate milk and endurance exercise recovery: protein balance, glycogen, and performance. Medicine and Science in Sports and Exercise, 44(4): 682-691.